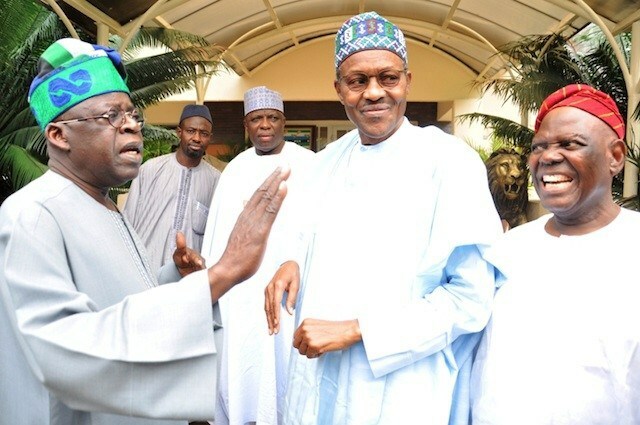 LATEST INFO : Buhari in secret talks with Tinubu, Akande – Royal Times of Nigeria. President Muhammadu Buhari is currently in a closed-door ‎meeting with the governing All Progressives Congress (APC) National Leader, Chief Bola Ahmed Tinubu and the former Interim National Chairman of the APC, Chief Bisi Akande in the Presidential Villa, Abuja. The duo, who arrived the State House few hours after former President Olusegun Obasanjo made public his letter to Buhari, were chauffeured to the president’s official residence in the villa. Chief Akande in recent times has joined eminent Nigerians in the call for the restructuring of the country which appears to be running contrary to the position of the government. The agenda for the meeting between the President and the two APC stalwarts was not known, but the Obasanjo’s letter may form part of the discussion.